Are you a business entity who is looking for a wordpress theme which lets your business provide affiliate options ? Or you are a affiliate marketer who want to market other business services through your website to earn a share? Fear not this article will do much justice for business and affiliate marketers alike. Most successful affiliate websites provide indepth review on products and they don’t even look like selling anything. As a Business Entity. Have a great product ? Then you must build a affiliate market where you can let your affiliates bring sales. In return you must give them a share of your earnings. Business should have these below plugins which can be used in any wooCommerce supported theme to build a affiliate marketplace. Alternatively you can also use Easy digital downloads which has similar addons to build one. As a Individual Affiliate (like me). There are some basic plugin requirements which the themes dont offer like ThirstyAffiliates but most themes have seo and mailchimp, aweber integrated with them. Check these must have plugins. Mailchimp / Aweber for Newsletter and Subscriber management. Which is the best affiliate earning theme bringing earnings? All of them. If you are newbie then first of all you need to know the main factors which makes any website with affiliate products earn. The website should have a nice layout, pagespeed and content(lots of content). For these reasons using blogs are the best solution for affiliates as it helps affiliates to write about products, create awareness, reviews them, add comparisons to other services or products etc in a clean readable passion. Most affiliates choose blogs to earn well as it reduces the distance between you and your target audience. How to choose a practical theme from below list? It depends on the website you are going to build and from it a matter of personal choice. Are you trying to write comparisons of different products ? Are you doing a huge listing of best products ? Write single reviews of products ? Or a combination of all. Using WordPress blog themes will be a brilliant option to build a successful affiliate marketing website which will result in a long term business asset for you. Travel affiliate websites are not available for download like these other themes as they tend to cost more in development. Now you have to sweep through this brilliant handpicked collection of WordPress Affiliate Marketing Themes we have introduced today just for you. Like to build a blog which can deliver affiliate sales ? Try Voice. 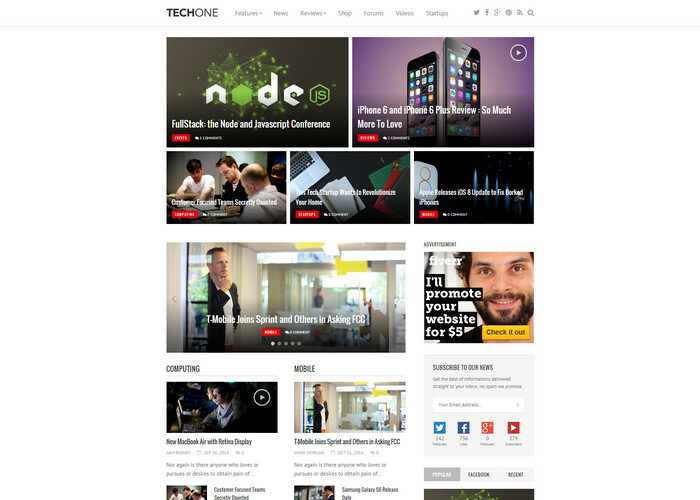 This is a specialized and visually appealing WordPress magazine theme with many blog features. The homepage layout is straight forward with clean display of posts with well categorized sections. The best part of the theme is it you can customize the sections according to your requirements without any problems. With over a 150 post listing styles for your website homepage, this theme is king among blog style wordpress themes. The modules are used to switch between or add different post categories to the homepage in a matter of minutes. Other preferences among the users is to have sticky sidebar and this theme has the ability to stick sidebars and also has option to create unlimited sidebars to each category. Has support for retina display, woocommerce products and the whole theme is fully responsive. Voice is the answer to your call. 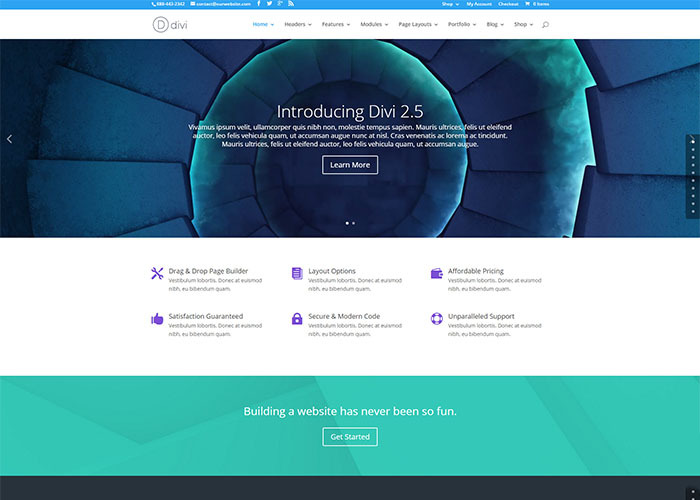 Divi is a huge theme for digital marketing professionals with a collection of premade layouts for your pages, posts. Want to build a landing page ? Just click on the premade layout elegant themes has put into this theme and make changes to suit your product requirements. If comparing products are your thing, then divi is a definite choice. You might have a work a few hours to create a custom layout for your page which will showcase product/service comparisons the way you want it. Nothing comes close to this theme for the flexibility it offers to the end user. Divi has full support for mailchimp, aweber and you get the option to integrate the code in the theme epanel options. Find our divi review for more details. A solution for both business entity and affiliate marketing pros. 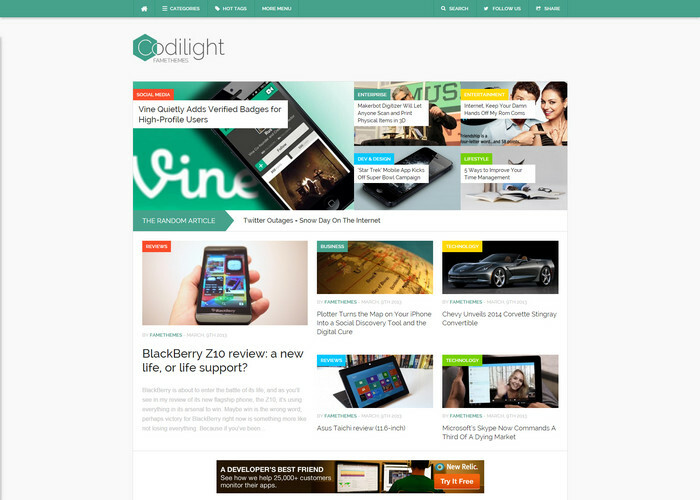 A brilliant premium magazine theme with options to create blocks of category based content on homepage. This theme fully has a built in post/page review system for authors which will let you rate a product. Designseer uses sahifa and we are happy with the options, features and performance it delivers. The built-in rating plugin supports schema data so that the articles display a rich snippet in google search results. 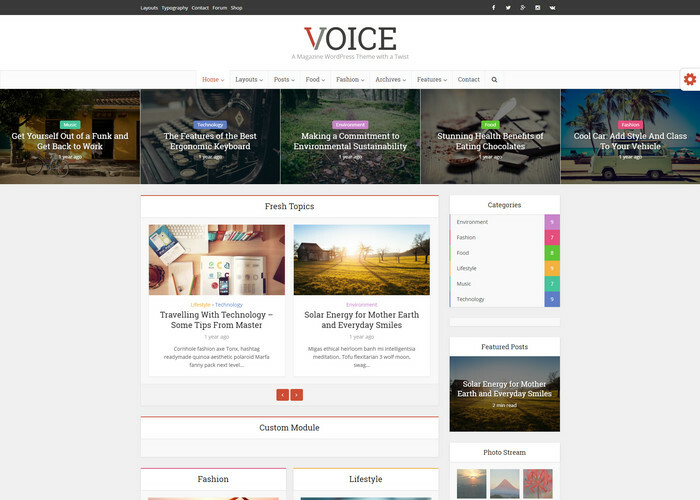 This theme is responsive, lets you build blogs and supports everything you can think of. Famethemes is one of the oldest group of wordpress developers who develop themes with great UI, seo and adsense optimization. As a personal user of this theme i have gained high ranking for any articles i have created much earlier than other seo optimized themes. The pretty posts section in left side of articles are the reason to high ranking as it sets up brilliant inter linking of articles sitewide even if you have missed to interlink to your own posts/articles. A review system is integrated to showcase ratings of the product being reviewed and that too in style. The responsive design will be handy for mobile devices as well as tablets. Overall an awesome wordpress blog theme to get double earnings from your marketing efforts. This is another theme i would like to show you which can be used as a magazine/blog theme with a fully integrated review system showing rich snippet data in google search results. The main purpose of this theme is to review products related to technology. The affiliate marketers can use this to make earnings by displaying, reviewing products from amazon, ebay or similar marketplaces quite easily. The theme design is very special in here and will satisfy online marketers and bloggers alike who like to get steady subscribers and readers. A nice homepage slider here will help you show off a cool call to action and a striking background photo. A premium theme for business who like to sell their single product/services with features like blog, review system, transition pages (fade, zoomout, parallax effects). You get powerful subscription tool along with this theme as these are included. 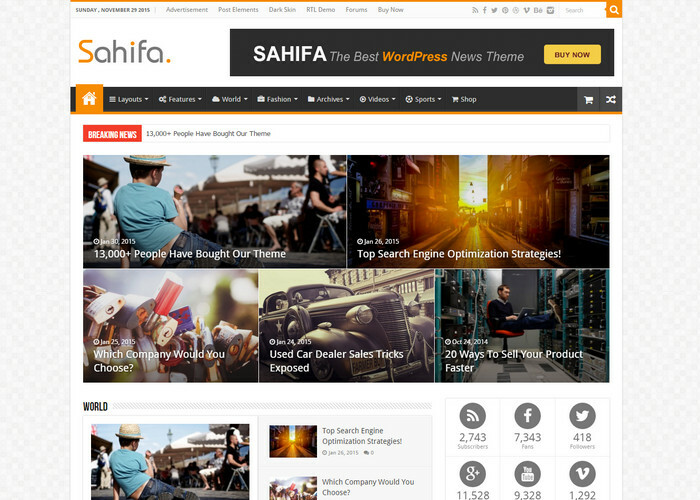 Build a good business presence with engaging high quality content and services with this theme. 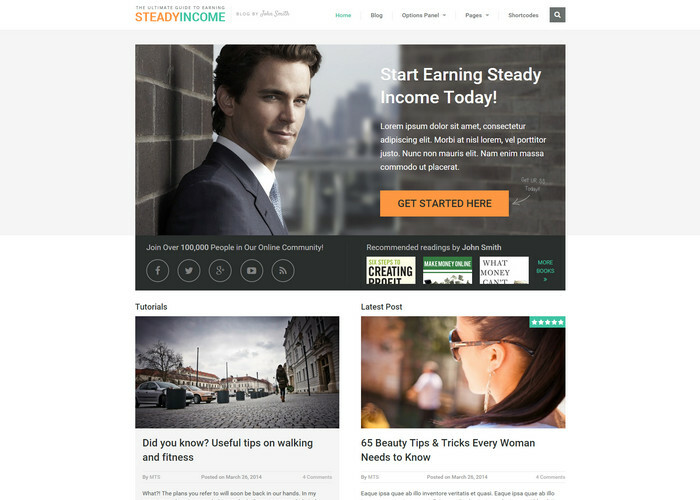 With a heavy focus on building a brand website by integrating social icons, featured product display and blog, steadyincome can get you some serious income. As the name goes, best is a responsive theme with a fully customizable and fast page loading speeds. Mythemeshop themes are known for its google adsense optimized layouts with smooth ajax loading pages. You get full support to build your blog theme for affiliate marketing with a great review plugin, retina ready support, seo optimized pages etc. Homepage layout can be customized to your requirements with different section layouts provided by this theme. The review plugin shows ratings on posts even in homepage slider and it supports rich snippet and show schema data in search. Best is a pretty pack of blogging features in one theme. Anything you review will not go unnoticed if you use Rehub. 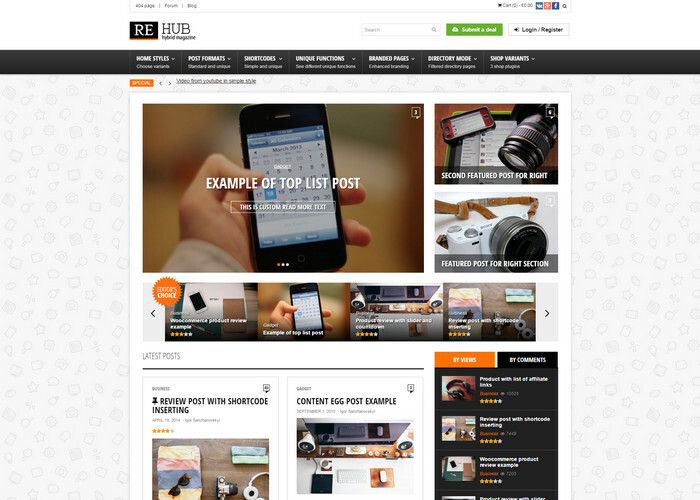 Rehub is a magazine style theme known for its powerful set of features to engage users in coupon, deals and affiliate markets. The review system used by this theme will add life to your reviews with a brilliant looking score panel added by the author and customer ratings. The option to add deals and offered products in a article is just mind-blowing when seen from a affiliate perspective. The layouts will help you to get high affiliate earnings as there are shortcodes to add a list of affiliate links to a single article with great offers and coupons. 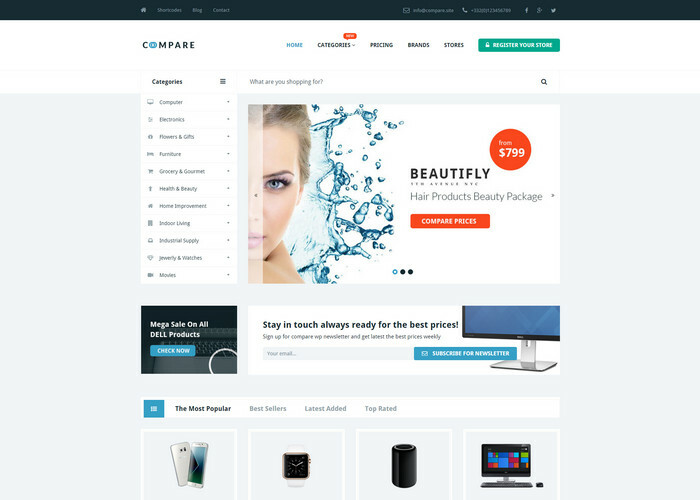 The theme can also showcase woocommerce products in a exciting way if you have a product to sell or review. Interested in coupon style affiliate marketing theme? Then Rehub is your deal. A marketplace theme for heavy engagement in daily deals with physical, affiliate or downloadable products. Deals and coupons are one way to attract visitors to your website with ease and later compel them to buy a product through your affiliate offer link. Kupon can be used to build audience in any niche without any comprise in quality of website design. The concept of the theme is to find and buy deals with a discount price. The navigation menu is very attractive and lists categories for high user engagement as well as the pages show a mix of multimedia elements and call to action buttons. Maps, user reviews are also integrated with the theme and you can set up the theme in no time. The search option might be another brilliant feature to find deals in appropriate section. 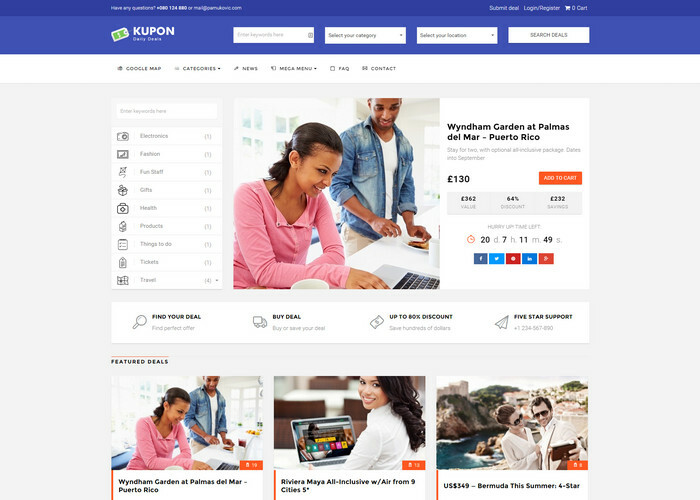 Kupon will build you a market website with deals and coupons. A powerful theme for comparing electronic products with price range across multiple marketplaces. The whole theme is lightening fast with high pagespeed scores for faster pageload. Engage in marketplaces like amazon, ebay to earn more with brilliant display of products by showcasing their prices on multiple marketplaces to the end users. The responsive theme can grab attention of mobile users with a clean and clutter free design. The theme is specially made for affiliates which lets you add links manually to each product with your own generated links. Stand out from the rest of the websites with a visually engaging content and website display with a intent to earn more with every click. User registration and email subscription through mailchimp service is integrated and this template has a customized user review system to rate the products. Comparing prices is now this easy. Product and service marketing is the key to earning in the future as many people tend to buy things online and they to tend to buy only after getting second opinion from a review website. 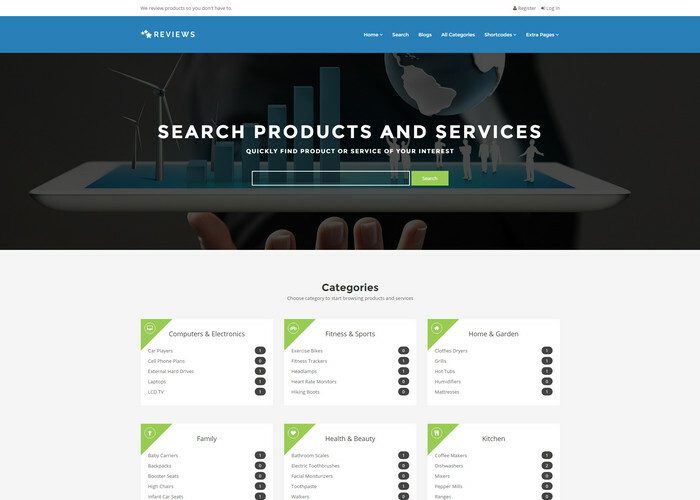 The homepage shows a multi level and well categorized sections which includes popular reviewed posts, editor picks, user picks and a even a huge list of categories. Homepage features has a full width slider which has a search engine to find the best product in your website. User engagement is the key to this responsive theme with user ratings and editor rating taken as a vote. A must have theme for anyone interested in review style theme which has high functionality and pagespeed. Overall a excellent review theme that will let you review everything. Author pro from studiopress loads like fire. 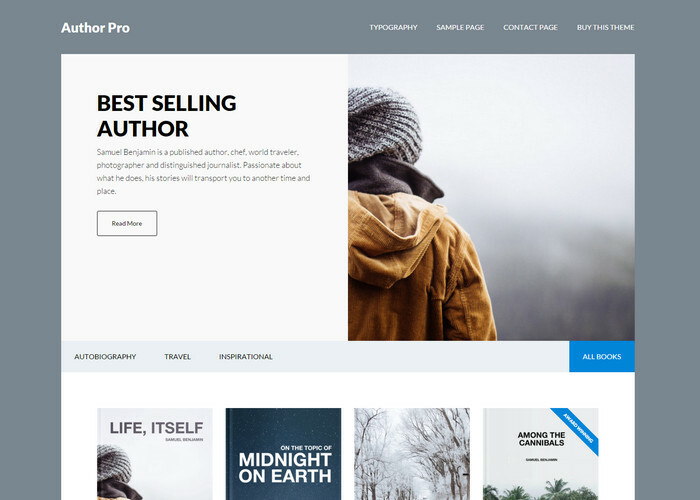 Built using genesis framework, author pro is a theme for websites which does e-book review and try to sell e-books of other marketplaces for a fair share of earning. The build is responsive and very minimal in design with more focus on books. Authors will find its compelling to write reviews on this highly readable wordpress theme which has great features to back the design. 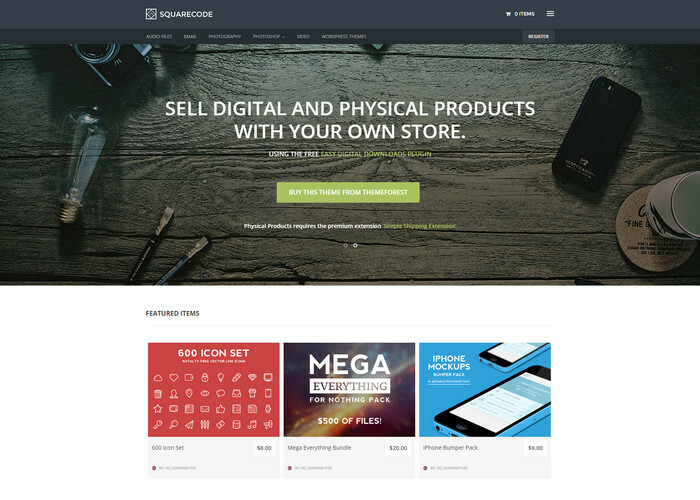 Suqarecode is a ecommerce store theme supported by Easy Digital Downloads and offers options to create content with affiliate links as well. Most used cases are for providing free download resources to the users. Building a multi author marketplace like amazon, themeforest, ebay is also possible with this theme but at a minimal level and features. From a designer perspective this theme is a boon to provide paid resources as well as list affiliate products. The theme is well optimized to boost seo rankings with a fast page loading speeds to back it up. The repsosnive design support will make the theme look great on mobile devices and retina support will give crisper showcase of your content on larger screens. The full width slider and the three column listing of products will make your homepage look brilliant in every way. 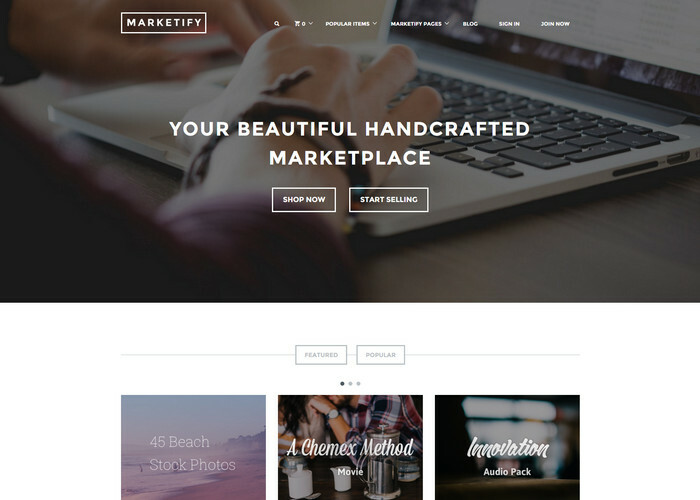 Building a Digital marketplace with this theme is a piece of cake. This theme has a similar theme design and options as squarecode and it also uses Easy digital Downloads which will help you add affiliate links as well. Since the theme is fully supported by EDD you may have to stick with themes which supports EDD in case you want to switch. Choose a homepage design to match your needs with the collection of pre designed layouts built for this theme. The overall design is clean with clutter free layout and flat design to build a digital marketplace. 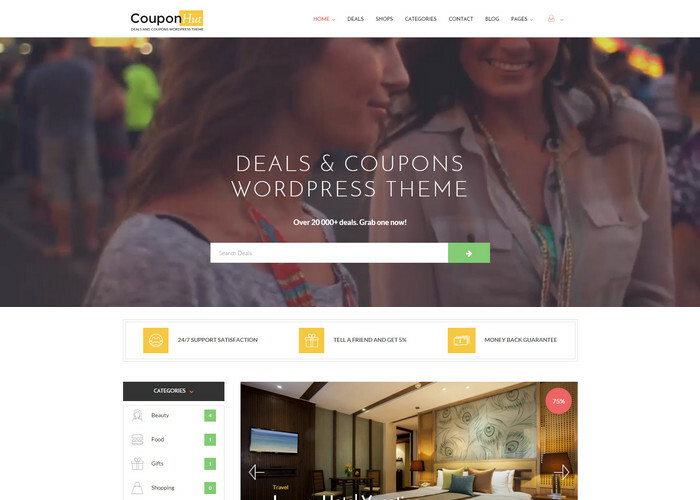 A recently released coupon and discounts theme for wordpress platform which will power your affiliate marketing effort to reach new heights. The image rich footer design and homepage sliders will blow your mind. A rating option is placed on the featured image section of posts where user can take the deal, view coupons and rate the post if they are satisfied with the deal. This theme will support your requirements to build a marketing theme with a brilliant rating system, header search and customizable widgets. A blogging theme for bloggers who are more focused on reviews products in a blog as this theme will provide easy to build website layout, preview of large amount of posts in homepage etc. The dynamic layout is appealing wit ha full width slider image showing a call to action button for high click through rate. Place sticky posts on homepage by making an important post featured in the post options. Woocomerce product integration and clean overall code will give you room for further custom editing of theme. 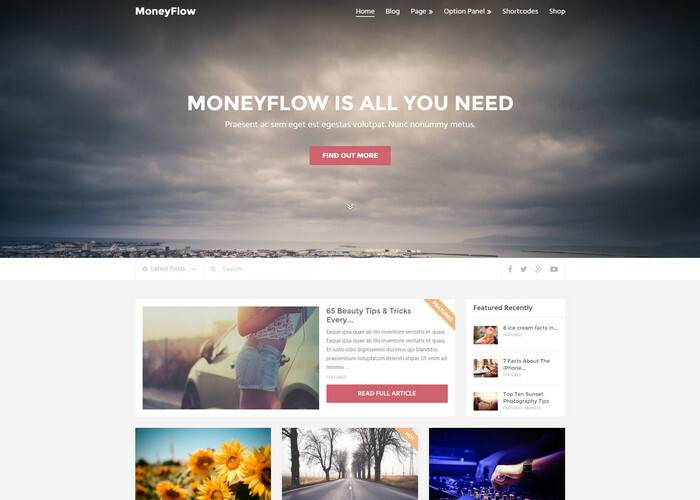 Moneyflow is a overall package for bloggers who want to make some serious money online. 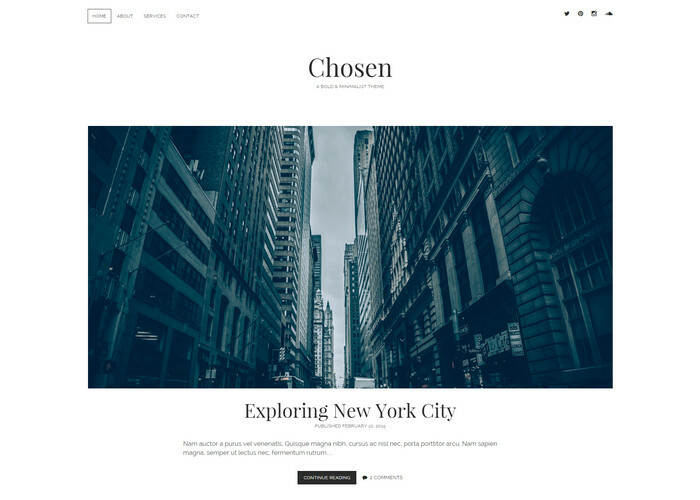 A brilliant and clean typography oriented blog theme for wordpress bloggers who want a bold and minimalist free responsive theme for affiliate marketing to write daily product reviews. The homepage introduce a boxed slider image and a two column post layout throughout to showcase your articles. A brilliant startup option for new affiliates and you might want to check out these pages as well if you are interested in free WordPress themes 2015 and free personal WordPress blog themes. yes they arent not enough for affiliate site.